Between my food science conference with endless samples of random foods, a brief bout of food poisoning, and my pizza-filled return to Madison, I will fully admit my diet would make any nutritionist weep. Although I've been trying to eat healthier, between cooking my proteins with less fat and fewer carbs and attempting to eat more fruits and veggies, it's been particularly difficult for the past week. That's why I'm excited to be back in my apartment (for two weeks, at least) with a pantry and freezer to clear out and full access to my favorite farmers' market. 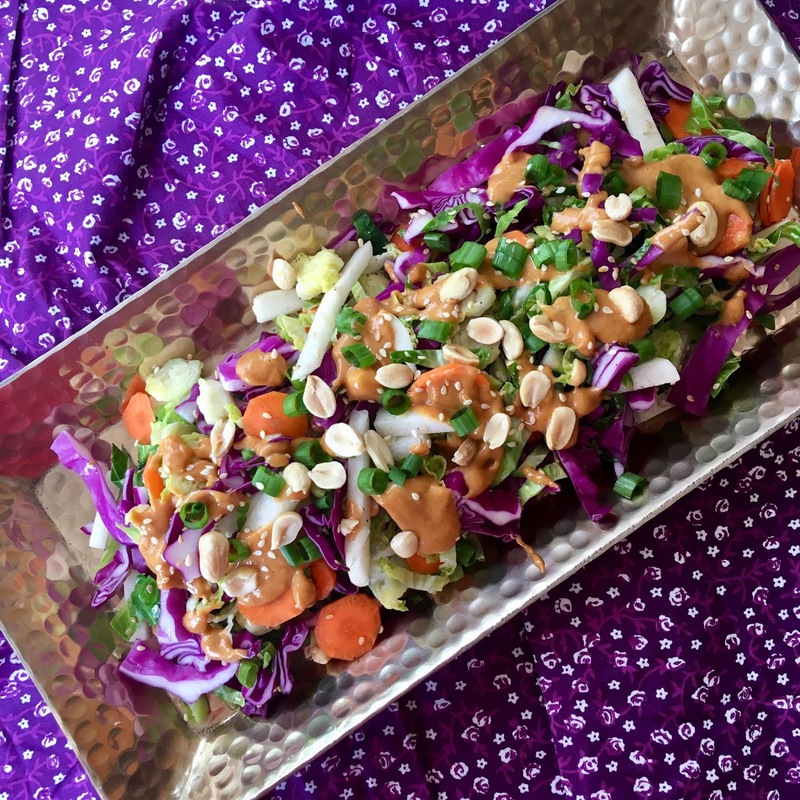 I can make plenty of healthy dishes like this Thai brussels sprouts salad, which only uses ingredients you probably already have at home and tons of fresh produce. The dressing itself is particularly versatile and can be used for anything from other salads to drizzled on poultry. 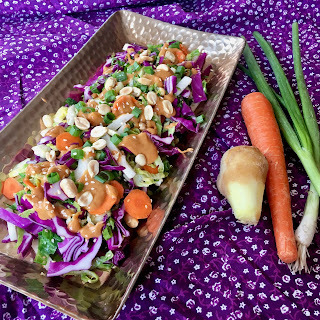 The salad consists of brussels sprouts, red cabbage, carrots, and jicama with a Thai dressing, peanuts, scallions, and sesame seeds. None of the veggies oxidize (turn brown) particularly quickly like apples or potatoes, so you can make it hours in advance--or even the day before--and it will still be fresh and gorgeous. 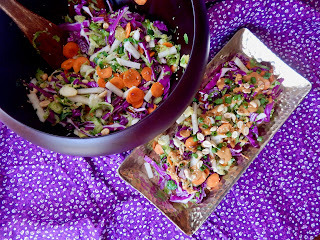 I wanted an easy-to-eat salad with lots of textural variation, which is why I shaved things like the brussels sprouts and cabbage (and sometimes even the carrots) and cut the jicama into matchsticks. The carrots are even prettier as thin coins, which is why I passed them over my mandoline as well. The mandoline makes everything so much faster and perfectly even, but some good knife skills will keep things moving as well. 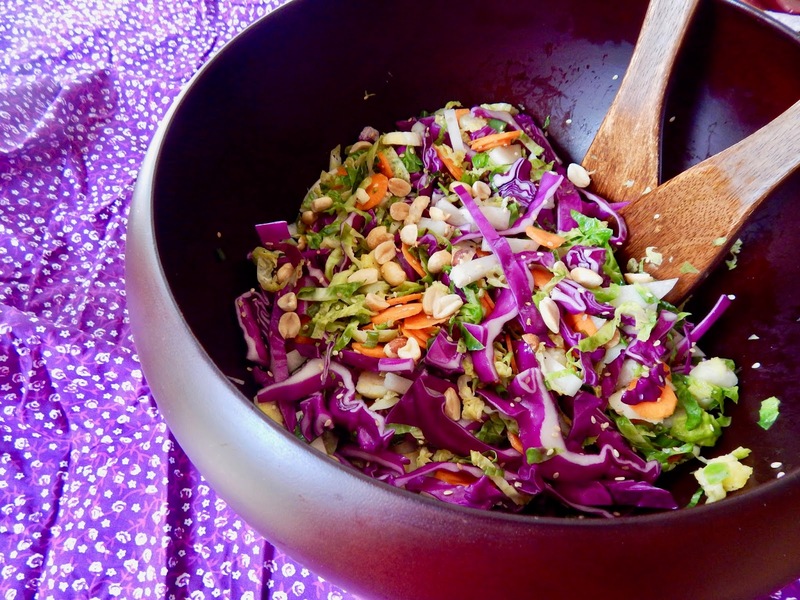 Technically this can be a raw salad, so it's up to you whether you like your brussels sprouts raw or cooked. I cook mine in a sesame oil blend for a few minutes until crispy and cooked through, and it doesn't take long since they're shaved pretty thin. Cooking them also gives you the option of a warm salad instead of a chilled or room-temperature one. In my opinion, the textures of the other veggies are best when they are raw, but feel free to throw them in with your brussels sprouts as well. 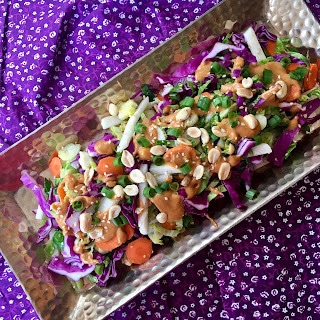 The dressing only takes a few minutes since all you have to do is measure and whisk a handful of ingredients together: peanut butter, soy sauce, coconut milk, lime juice, honey, ginger, garlic, and a squeeze of Sriracha. Although the combinations may seem odd, they harmonize beautifully and the ratios are easy to adjust if you want it a bit more sweet, spicy, savory, etc. It may also seem like you're using a ton of some of the ingredients, but don't worry: that's only because I had to triple the recipe to keep up with my household's demands. If you like a lightly-dressed salad, you can easily cut the recipe back down. But trust me, that won't be necessary; I have witnessed my dad try to eat it like a soup, so you'll definitely want more. Trim, wash, and shave the Brussels sprouts. Shave the cabbage. Grate or slice the carrots. Cut the jicama into matchsticks. Slice the scallions. Heat the sesame oil and vegetable oil in a skillet. Add the Brussels sprouts and cook for 5 minutes or until crispy. Whisk the peanut butter, soy sauce, coconut milk, lime juice, honey, ginger, garlic, and Sriracha together. Toss the vegetables, scallions, and dressing together. Top with the peanuts and sesame seeds. Gotta try this salad! Thank you for sharing the recipe!